These 2" figures were initially made by LP (bearing their trademark underneath as shown below) but are more often found with no markings at all. They were still being made until recently (and may even be in production today), in which case they may sometimes have a little oval sticker in gold marked "Made in China." 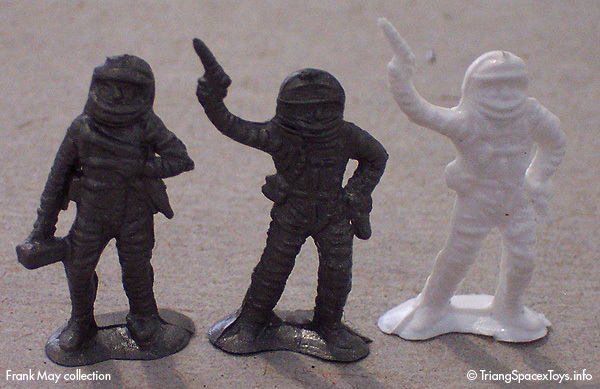 The later copies have a harder feel to the plastic, and are more sharply moulded. These are more crude copies of the LP 1" figures. More on the Blue Shield page (use your browser's Back button to return here). The bag rider is only marked "made in Hong Kong" so we don't have a manufacturer for these reasonably good 2" copies of LP figures. They are compared below with original LP 1" figures on either side. 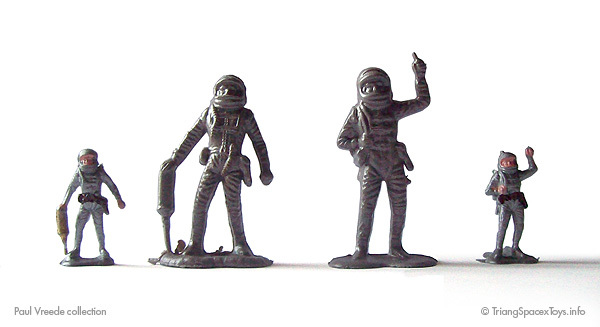 These figures are just under 2" (5cm) tall and were sold in the UK as cake decorations. Unmarked, and not very sharply moulded, they come in the four poses and six colours shown. Unilever sells ice lollies under various brands throughout Europe - Wall's in the UK, Langnese in Germany, Ola in the Benelux to name but a few. 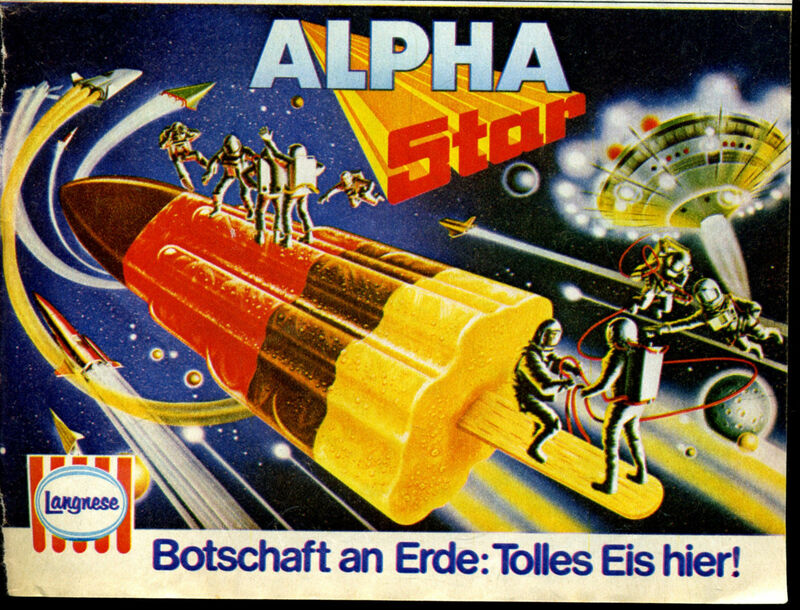 One of these was Alpha Star, a rocket-shaped water ice lolly in different national colours for each country. 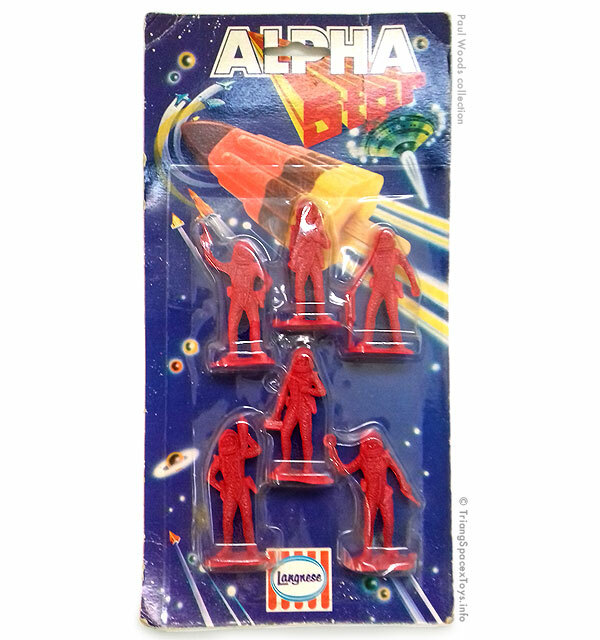 In Germany (at least) this was promoted by offering a set of six 2" astronaut figures, probably during the late 1970s (Moonbase Central has saved an advert offered on eBay as being from a 1979 comic magazine). The backing card measures 27 x 13.9 cm (10 5/8 x 5 1/2 in). 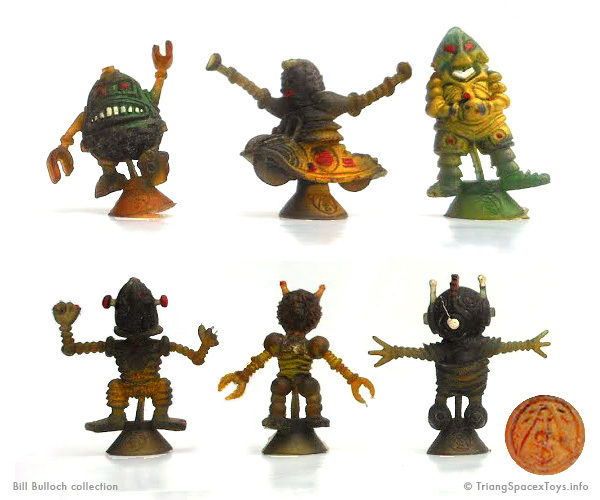 All six LP aliens exist in a larger version, made from a soft and rubbery-feeling plastic with painted details. The figures have no base and the manufacturer is unknown. The three examples above are 42 mm - 47 mm / 1 5/8 in - 1 7/8 in tall. And because they appear to be very similar if not identical to the figures below, it's possible they originally each had a suction cup as well. These aliens have a suction cup to keep them upright. 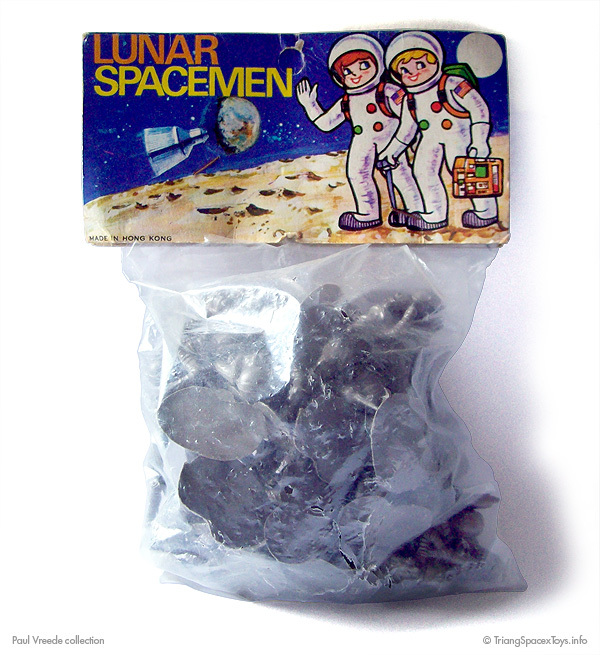 Made by a company with an unknown trademark, these were sold on a blister card as the Moon Platoon by Imperial Toys in 1969, and also exist in red and blue base colours. 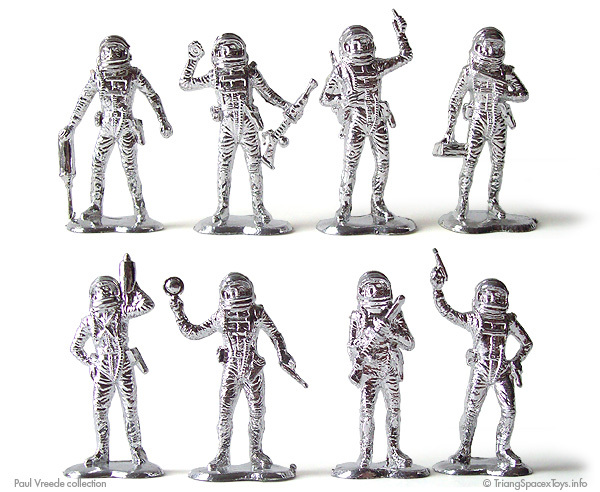 Similar if not identical to the other rubber figures, aliens on suction cups are joined by astronauts also based on designs by LP. 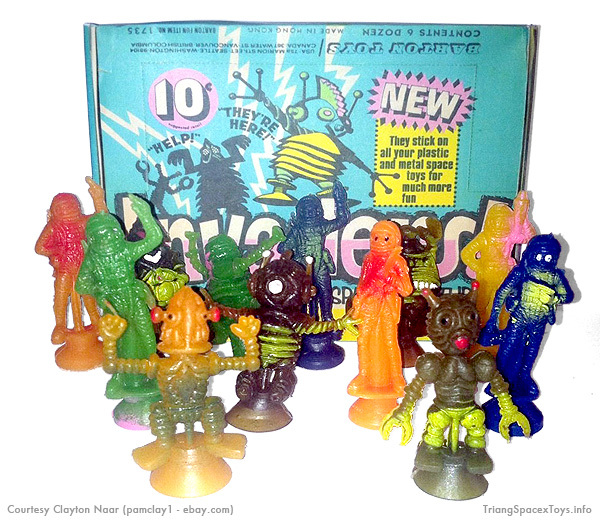 Although probably sold by various repackagers, these are called Invaders by Barton of Seattle and Vancouver, sold from a box holding 6 dozen with item nr 1735. The box lid can be folded into a display header. Another three versions with suction cups, plus one in transparent hard plastic that used to be on a keyring.